Fishguard is back on the rails. The rail service we’ve been campaigning for starts this September. The planners are working on a timetable now. Soon the Welsh Assembly Government will canvass your views. So even before the first new train runs, we can all help to make the service a success. From September, it’s how we use the service that counts, not just what we say. This website, Fishguard Trains, is here to bring you news as it breaks, to promote rail use and publish useful information, anything from timetables to links with the wider world of travel. We’re open for you to discuss every aspect of the new service – good, bad and improvable. I am planning an organised walk from the new service. i would be grateful know when the timetable is available for this autumn amble. Our best guess at present is late June/early July. The new service starts in September, probably with the start of the winter timetable on September 5th. Normally Advance tickets are available 9-12 weeks before travel, so a timetable has to be available too – that’s some time between June 13 and July 4. BUT, the community consultation on the timetable is due to start this April, and it’s hard to see that delivering a result in under two months, which is also late June, more likely later. 1 The existing lunchtime boat train probably won’t be retimed. 2 Expect two new return journeys between 7am and 12noon, and three between 2.30pm and 7.30pm. 3 Keep checking fishguardtrains.info – we’ll publish news as soon as we get it. 4 Be sure to respond to the consultation – it must hear what your group needs from the new timetable. 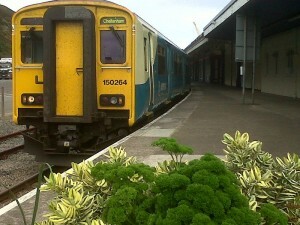 Extra trains and the return of Goodwick station was music to my ears. As a frequent train traveler from Scotland to Goodwick it’s often hard to connect train services and if possible means arriving in the dark at 2am. My one problem that remains with the service- and I don’t know if there has been discussion into this- will there be a ticket service available at Fishguard Harbour/ Goodwick Station? Throughout Scotland even some of the smallest stops have a fast-ticket machine which allows you to buy tickets on the day or pick up advance tickets you’ve ordered on the internet. At the moment I have to ensure I buy my advance tickets before arriving in Fishguard as then I have to ensure a 5 day delivery window for postage. The only other option is to pay very high fares on the train. This would be such an advantage, not only to the bargain hunters like me, but for tourists planning their holidays in advance. Good point Scott. Having Fishguard & Goodwick station open by September is looking very unlikely now, and even if it happens there won’t be much to look at so I expect it’ll be no place to put a ticket machine. However SPAD’s suggestion of displaying train trimes on the electronic bus information displays in Fishguard town centre has given me an idea, put the ticket machine you are asking for in the town hall. You still would be unlikely to get a ticket machine, but the town hall would be a better place for one until there’s money to do a proper, more permenant, job of Fishguard & Goodwick station I think. Good thought, Rhydgaled. Spad’s saying nothing more for now, but some of these ideas may turn out to have legs. Oh yes, I never really expected a ticket machine at the proposed Goodwick station, I was thinking more at Fishguard harbour but having it in the town hall is a brilliant idea! Anywhere that’s closer than Haverfordwest ticket station! Serious work must be done to integrate buses originating and terminating to/from Cardigan, via Newport and other villages in between, to allow people the option to use the buses to meet and use all the new trains, as opposed to using a car/taxi. It is vital to promote and get people in the mindset of using the service which will surely lead to the retention of the service once the trial period is over. If people to consider this as first option and this availability in place, it will exclude a whole bunch of people in the long run. Could not tickets be sold in newsagents, supermarkets, petrol stations and bought and printed on-line. It can only make is easier for people to think bus/train as first option. In fact a combo-ticket for bus & train is the way to go!! !